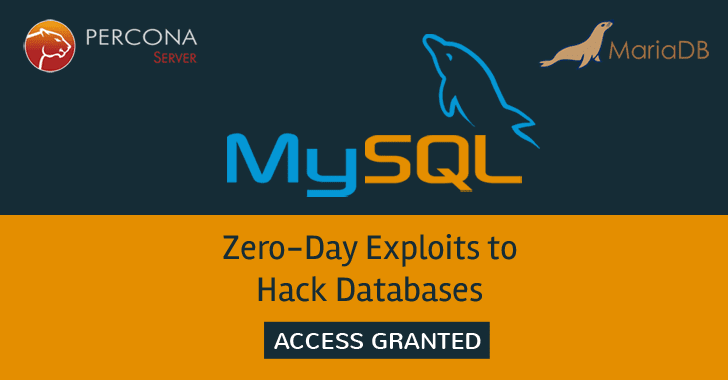 Two critical zero-day vulnerabilities have been discovered in the world’s 2nd most popular database management software MySQL that could allow an attacker to take full control over the database. Polish security researcher Dawid Golunski has discovered two zero-days, CVE-2016-6662 and CVE-2016-6663, that affect all currently supported MySQL versions as well as its forked such as MariaDB and PerconaDB. Golunski further went on to publish details and a proof-of-concept exploit code for CVE-2016-6662 after informing Oracle of both issues, along with vendors of MariaDB and PerconaDB. Both MariaDB and PerconaDB had fixed the vulnerabilities, but Oracle had not. The vulnerability (CVE-2016-6662) can be exploited by hackers to inject malicious settings into MySQL configuration files or create their own malicious ones. The above flaw could be exploited either via SQL Injection or by hackers with authenticated access to MySQL database (via a network connection or web interfaces like phpMyAdmin). "A successful exploitation [of CVE-2016-6662] could allow attackers to execute arbitrary code with root privileges which would then allow them to fully compromise the server on which an affected version of MySQL is running," Golunski explained in an advisory published today. This could result in complete compromise of the server running the affected MySQL version. The researcher also warned that the vulnerability could be exploited even if SELinux or AppArmor Linux kernel security module is enabled with default active policies for MySQL service on the major Linux distributions. The flaw actually resides in the mysqld_safe script that is used as a wrapper by many MySQL default packages or installations to start the MySQL service process. The mysqld_safe wrapper script is executed as root, and the primary mysqld process drops its privilege level to MySQL user, Golunski examined. The researcher will soon release details and full exploit code for CVE-2016-6663, the flaw that allows low-privileged attackers to make exploitation trivial. Golunski reported the zero-day flaws to Oracle on July 29 and other affected vendors on July 29. While Oracle acknowledged and triaged the report, scheduling the next Oracle CPUs for October 18, 2016, MariaDB and PerconaDB patched their versions of the database software before the end of August. Since more than 40 days have passed and the two vendors released the patches to fix the issues, Golunski said he decided to go public with the details of the zero-days. Until Oracle fixes the problem in its next CPU, you can implement some temporary mitigations, proposed by the researcher, for protecting your servers. "As temporary mitigations, users should ensure that no MySQL config files are owned by the mysql user, and create root-owned dummy my.cnf files that are not in use," Golunski wrote. But remember, the above mitigations are just workarounds, so you are advised to apply vendor patches as soon as they become available.